South Perry Pizza cook Nate Coyne rounds dough by tossing it into the air. If you happened to live in the Italian city of Naples in the 18th century, you might have witnessed the invention of one the most beloved foods of all time: pizza. Originally, it was a meal for the working poor who often didn't have kitchens, or sometimes even indoor living spaces. They needed inexpensive food that was easy and quick to eat. Street vendors and corner restaurants began to sell a flatbread topped with tomatoes, cheese, oil, anchovies and garlic, among other things. Over the years, immigrants from Naples brought their families, and their pizza recipes, when they came to the United States. Although the first American pizzas were still made in the Neapolitan style, soon the recipes morphed to meet the demands of the public. Major cities developed their own signature style. Although the toppings are important, pizza is nothing without the crust. The recipes and ingredients are often quite similar, but small changes in process and technique make a big difference in taste. There isn't an Inland Northwest pizza style. Rather, we have a wide variety of crust styles to choose from, each with their own personality. When they opened Pizza Rita in 1989, Brian Dickmann and his wife June wanted to differentiate themselves from the pizza scene at the time. They chose to make a round pan pizza, which is rolled out and allowed to rise in the pan, like bread, before baking, rather than being tossed and placed on a screen to bake. Each large pizza is made up of 24 ounces of dough (the thin crust uses 14). "It's almost a fried crust," says Dickmann. Chris Bennett opened David's Pizza in 1993. When he sold it in 1995, he was ready to try his hand at New York-style pizza, which is known for the way you can fold it over to eat on the run in the midst of a fast-paced New York City lifestyle. 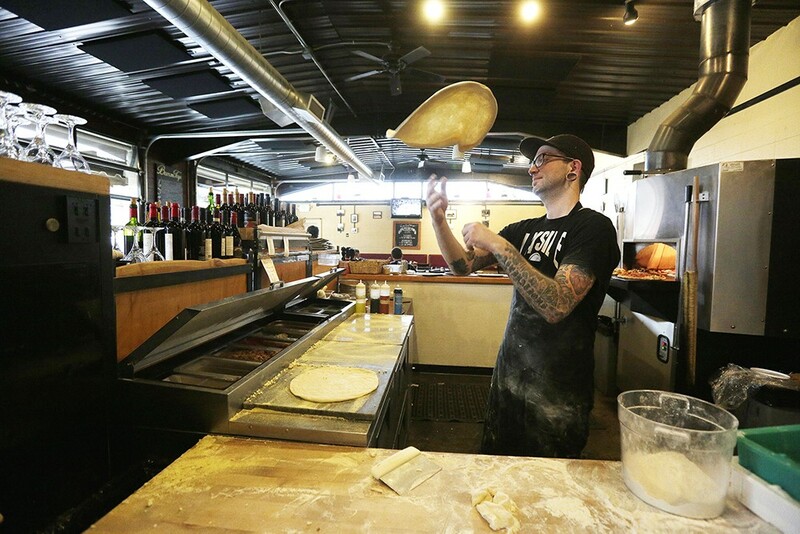 Now, at Bennedito's, Bennett crafts East Coast-style pizzas for the Inland Northwest. At 19 inches, Bennett's pizzas are a little bigger than a classic Neapolitan. This style takes anywhere from 12 to 15 minutes to cook. Unlike Neapolitan crusts, New York-style pizzas have sugar and oil in their dough. Pizza crusts can vary greatly depending on the style and cooking process. The majority of the craft pizza places in Spokane use a classic Neapolitan style for their crust, but that doesn't mean they all taste the same. "It's chemistry, and chemistry is not just dictated by what goes into it, but how it's cooked and the lengths of time that are used to let the different processes take place," says Doug Johnson, co-owner of Fire. Traditional Neapolitan pizzas are made with only flour, water, salt and yeast. "We start with a biga, which is a pre-ferment. It's very spongy. The pre-ferment is what we build the dough from. 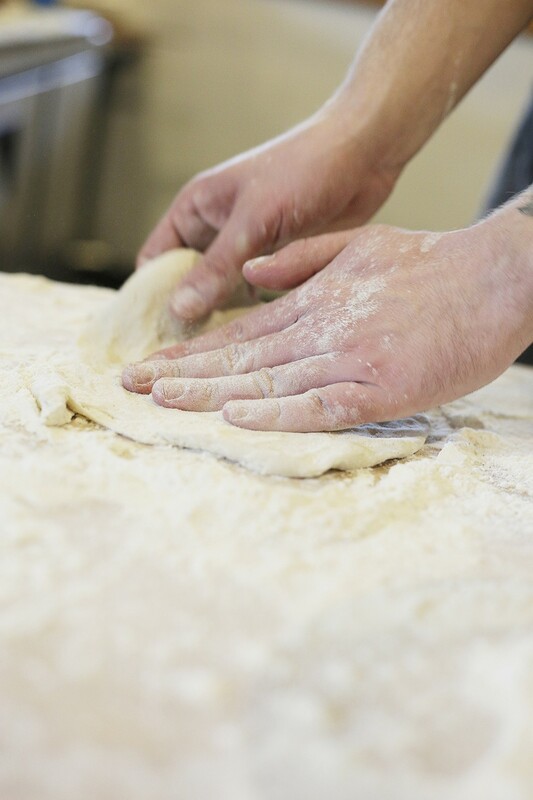 We make a biga every day, and then the following day we use that biga to create the dough." A characteristic of the Neapolitan style is a high moisture content. At South Perry, it's about 70 percent. "The nice thing about that is it produces a crisp but not crunchy crust, and sort of an open, airy crumb with a little bit of a chew to it. The high hydration also helps it to withstand the very high temperatures in the oven," says Siok. If the temperature is right, anywhere from 800 to 1,000 degrees, Neapolitan pizzas cook in 70 to 90 seconds. For successful Neapolitan pizza, you need a finely milled, high-gluten flour made in the Italian style, and a wood-fire oven. Although Seth Carey thought about using Italian pizza flour for Veraci, he decided to get his wheat closer to home. "I think that's what the whole concept is in Italy," he says. "Being true to the region." Following that train of thought, Carey uses applewood, instead of traditional oak, in his wood-fired oven. He's also built his ovens from scratch, which makes for a unique baking experience and flavor. If you're curious about the difference that Italian flour makes, you might want to do a taste test at the Boiler Room. According to their dough expert, Will Stewart, their flour is the most popular type for Neapolitan pizzerias in Italy.